Please join Starhawk and herbalist Amythest Faria for a five-day intensive in magical, practical and herbal healing for self, community and the earth. “From the great above, she set her ear to the great below…” The Goddess Inanna descends to the underworld to face her sister, Ereshkigal, Queen of death. Hanging on a meathook, she wonders…will she ever rise again? We’ve all had those times in life of loss and grief, when we wonder how we’ll ever find hope and regeneration again. While grief is a natural part of life, there is another layer of torment we suffer from the ways we have internalized oppressive structures of power. But when we face that self-hater within, we can transform it and liberate our great creative energies. In this intensive workshop, we use the tools of magic—ritual, trance and energy work, as well as the knowledge of the healing herbs and practical potion-making of compost and earth-healing brews to help us transform. The myth of Inanna guides us through the process of descent and return, bringing back the deeper knowledge only the underworld can provide. Cost: Sliding scale $650-$850 includes all instruction, meals, accommodations, and ongoing network. This intensive is designed to offer deeper training for those who have taken a Sacred Earth Apprenticeship, attended a Reclaiming Witchcamp or skills training, or who have other training in the magical skills of ritual and ceremony. If you have worked with the elements before, this is a chance to refine your tools and deepen your magic, visualization, energy sensing and shaping, trancework and plant communication. All who love plants are welcome, no herbal pre-requisites are required. We will begin each day with the collective creation of sacred space, before focusing on the nuances of magical tools for collective and personal work. Afternoon sessions will include hands-on work with the wild and cultivated plants in the hills of Cazadero as well as at Starhawk’s nearby permaculture farm, Golden Rabbit Ranch. Evenings will take us through a cycle of co-created rituals delving deeper into the myths and stories we learn from the plants. you have been practicing magic and ritual for some time and want to deepen your skills. your magical/spiritual practice needs a new boost of inspiration. you are an aspiring or experienced herbalist and want to deepen your spiritual connection to the plants. you hunger to connect with others in deep and meaningful ways. you want to deepen daily practices in the embrace of the elements and get your hands in the dirt. you want to create and facilitate rituals and healing practices for a wide variety of situations. you are ready to take time and space out of daily rhythms to shift your energy in the world. This course is about to begin but we are still accepting last minute applications! Accepted applicants will be asked to make a deposit payment to hold their space. 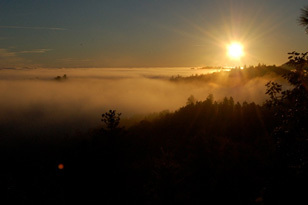 Our Sacred Earth Intensive is held in the Cazadero Hills area of Northern California, in west Sonoma County. Our standard housing is included with tuition: there will be bed and camping options available. We advise all students to bring layers to be prepared for both hot and cool weather, as we will spend ample time together outdoors! Your welcome packet will include a detailed packing list. Then continue below to hold your space with a deposit or payment in full.